It’s that time of year again. Snow is falling, sleigh bells are ringing and Congress still hasn’t figured out how to fund important parts of the government. In a televised meeting with Democratic leaders at the White House on Tuesday, President Trump said he would be “proud to shut down the government for border security” if Democrats wouldn’t vote to spend $5 billion to build a wall along the U.S.-Mexico border. But that may not be a very popular stance. According to an NPR/PBS NewsHour/Marist poll, 57 percent of Americans think Trump should “compromise on the border wall to prevent gridlock,” while only 36 percent think he shouldn’t compromise even if that means a government shutdown. For Republican and Democratic congressional leaders, the public relations game around government shutdowns is usually focused on trying to pin blame on the other side. After the government closed for 16 days in 2013, a Washington Post-ABC News poll found that more Americans placed responsibility for the impasse on Republicans than on President Obama. And nearly 3 in 5 Republicans said they disapproved of how their party handled the shutdown negotiations. This time around, the prospect of a shutdown seems to have spooked some congressional Republicans. Senate Majority Leader Mitch McConnell has said that he hopes a partial shutdown can be avoided. And Democratic leader Nancy Pelosi, who is expected to be the speaker of the House in the next Congress, reportedly described Trump’s publicly expressed willingness to shut down the government as a political accomplishment. But Democrats probably shouldn’t celebrate. Even though Americans mostly blamed Republicans in the aftermath of the 2013 shutdown, Obama arguably didn’t escape unscathed: His favorable rating dipped below his unfavorable rating for the first time in his presidency. Government shutdowns can have serious political fallout in the short run for everyone involved. Holding up budget negotiations over a border wall may seem like a good way for Trump to maintain support from his core followers, but mixing a policy that appeals primarily to his base with a government shutdown could backfire, especially if Trump is ultimately unable to secure funding for the wall. 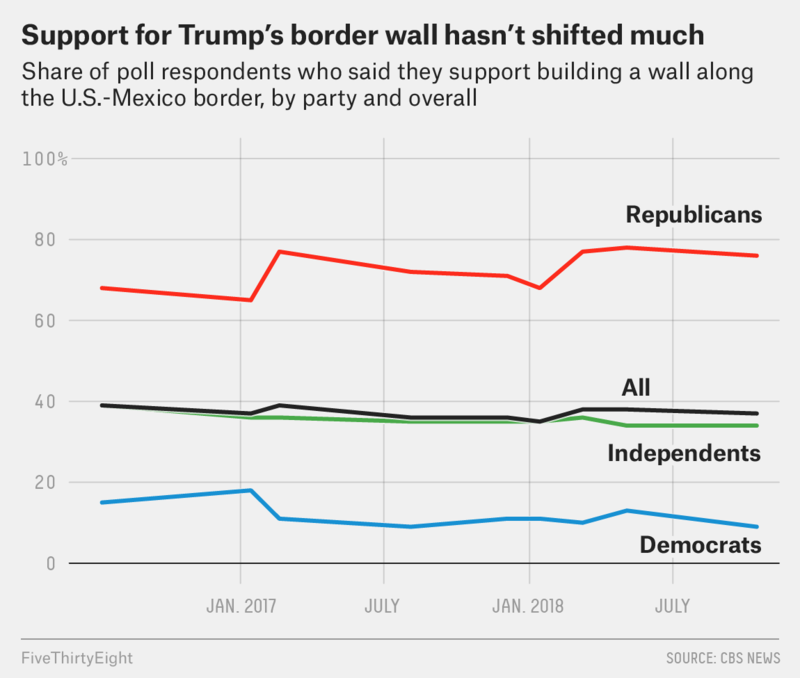 In the new NPR/PBS News/Marist poll, 30 percent of respondents who identified themselves as Trump supporters said they thought he should compromise on the wall. And a CBS News poll from November found that 28 percent of those who favored Trump’s border wall did not believe that it was worth risking a partial government shutdown over. There will likely be pressure on Trump from both the public and from his own party to avoid shutting down the government. If a government shutdown interrupts the holidays this year, while the political fallout might be a wash in the long run, there could be more lasting consequences for things like economic growth, scientific research and veterans benefits that might leave some people more dissatisfied and angry with government. A straw poll of the 2020 Democratic primary field among members of the progressive group MoveOn.org found U.S. Rep. Beto O’Rourke of Texas on top, followed by former Vice President Joe Biden, Sen. Bernie Sanders and others. Meanwhile, an Emerson College poll found O’Rourke trailing Biden and Sanders. So what do we make of this? Remember that early polls are useful as an indicator of who is likely to run in a primary election, but they don’t always tell us much about who might win. 44 percent of Americans think comedian Kevin Hart made the right decision to step down as host of next year’s Oscars ceremony, according to a Morning Consult/Hollywood Reporter poll. Twenty-six percent said he made the wrong decision. Hart bowed out after facing criticism over old tweets that contained homophobic remarks. An analysis of the best places to work in the federal government by the Partnership for Public Service found an overall decline in morale among federal employees. The Consumer Financial Protection Bureau posted a whopping 25-point decline in employee satisfaction (on a 100-point scale). The Departments of Education, State and Agriculture had smaller declines. The most improved agency was the Federal Election Commission, which had an increase of 10 points. NASA ranked as the top large federal agency, with a score of 81. 61 percent of Americans say they are concerned that they or a member of their immediate family will have to pay higher health-insurance premiums in the next few years, according to a Gallup poll. Forty-two percent said they were worried about themselves or someone in their family having to go without health insurance. Wisconsin state lawmakers last week passed a set of bills aimed at curbing the power of newly elected Democrats, including the incoming governor, Tony Evers. According to a nationwide YouGov poll, 61 percent of registered voters said they thought that was inappropriate. According to a Gallup poll, 23 percent of Americans said they or someone in their household had personal, credit card or financial information stolen by computer hackers in the past 12 months. 39 percent of Americans told YouGov in an online poll that they either “strongly” or “somewhat” agree that there is a “war on Christmas” happening in the U.S. 33 percent said they “strongly” or “somewhat” disagree. The people of Madagascar will elect their next president in a runoff election on Wednesday. Two former presidents, Marc Ravalomanana and Andry Rajoelina, the latter of which overthrew the former in a military-backed coup in 2009, will be on the ballot. Polling during election campaigns is rare in Madagascar, and in September, the nation banned the publication of an opinion poll of the election, citing a threat to public order. In the first round of voting, Rajoelina won 39.2 percent of the vote, Ravalomanana won 35.4 percent and the incumbent president, who will not be in the runoff, won 8.8 percent. According to FiveThirtyEight’s presidential approval tracker, 42.4 percent approve of the job Trump is doing as president, while 51.6 percent disapprove (a net approval rating of -9.2 points). At this time last week, 42.1 percent approved and 52.3 percent disapproved, for a net approval rating of -10.2 points. 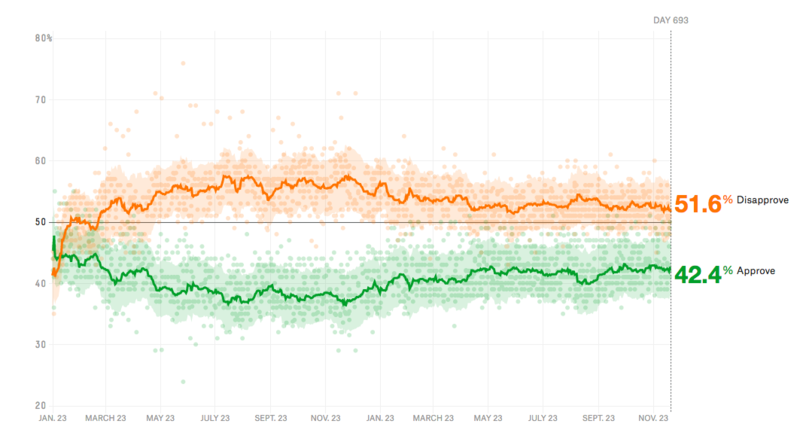 One month ago, Trump had an approval rating of 41.8 percent and a disapproval rating of 52.8 percent, for a net approval rating of -11.0 points. That’s the first poll we could find from CBS News since Trump made his border wall proposal that asked about support for the idea and provided a breakdown by partisan identity.